Here it is, once is not custom... 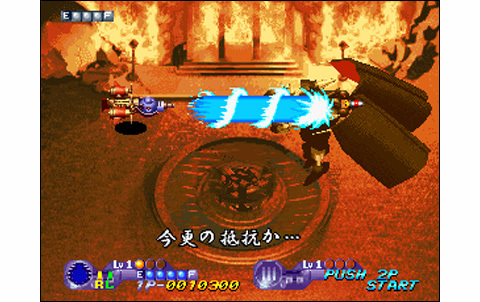 Finally, one game exists with which Neo Geo CD owners are able to taunt AES and MVS players. And yes, once upon a time, Ironclad/Brikinger only existed on the CD-Rom support. This was true until fall 2009, when the game was released on Wii Virtual Console. Then a few expert geeks came and made an ISO of it, before converting it for cartridges! 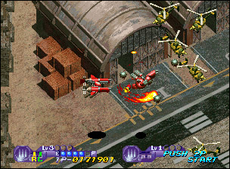 Some months later, here we are with this long-time awaited Shoot them Up on the Neo Geo, which is simply one of the best ever made on the system. Finally! 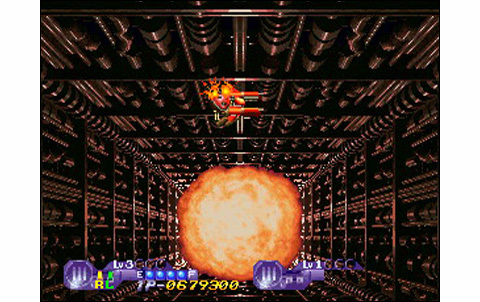 With its 176 megas, Ironclad is one great emissary of arcade games. 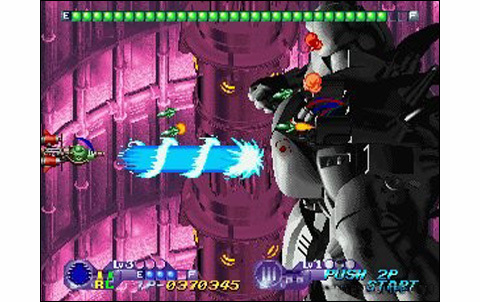 Side-scrolling shooting game, the soft is clearly in the R-Type line, declining it in a contemporary style- twentieth-first century one - the most pleasant way. 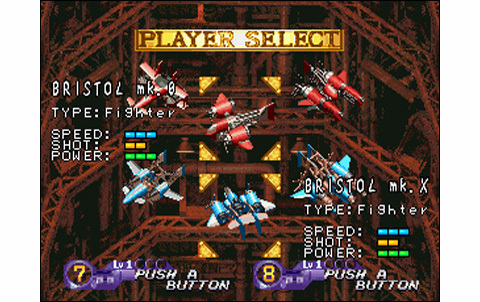 After choosing your fighter among om three different models (a powerful one, a fast one, or a balanced one, perfect for beginners) you fly over urban landscapes, forests, undergrounds, oceans, fighting the invaders. And the least we can say, is that stages are varied and numerous. 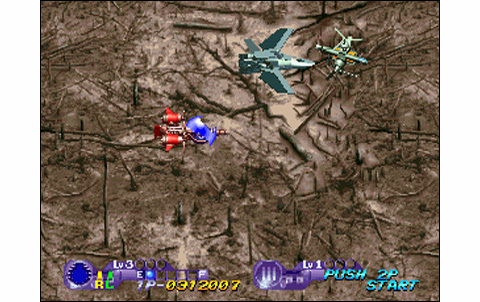 The system of path choice initiated by Darius Gaiden a few years before (see comparison with Pulstar) is taken back here, providing an interesting variety in the development of action. 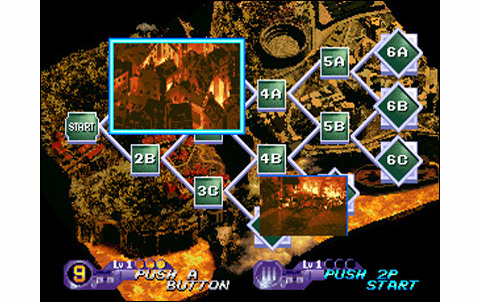 From the first stage until the end of the game, two different routes are available at the beginning of each levels. 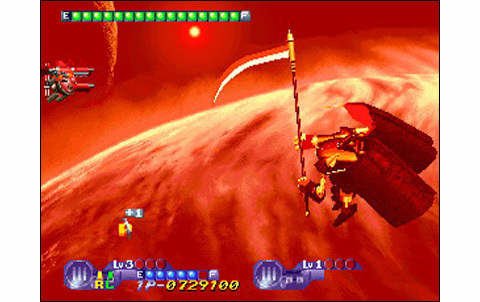 In total, no less than fifteen stages exist, and you'll have to clear six of them to finish the game, with three different possible endings. 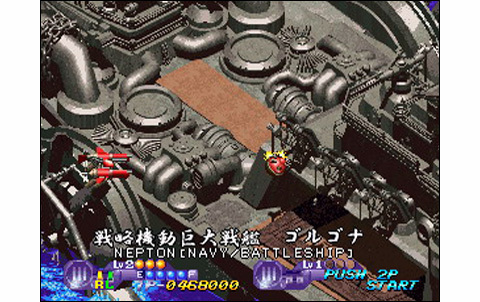 In other words, it makes you want to play the game several times, at least to see all the different routes and try the three ships and their arsenal of weapons! 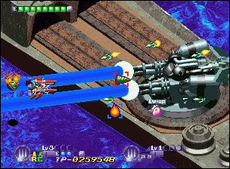 The vessels have an energy bar: it means you can be hit several times by enemy fire before destruction. It' s also possible to recover some health during the action. 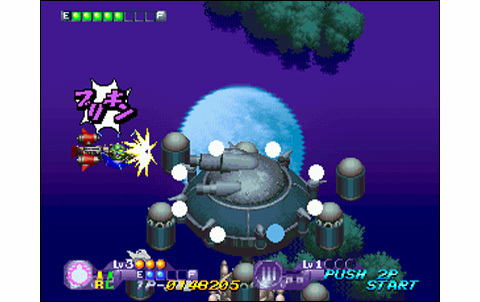 From the beginning, you're provided a module that can be used mainly as a shield, but that actually reveals to be pretty useful as a devastating secondary weapon! This one can be kept attached to the ship, kept at a variable distance as a secondary weapon, or launched when holding A. 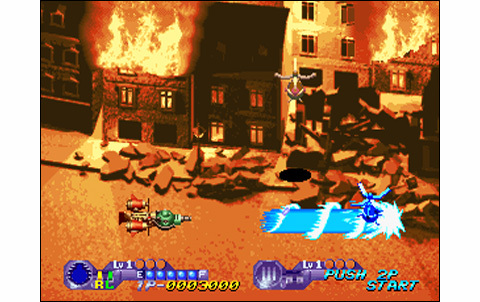 The main fire of the fighter (L-Arm) is available in four types, with four power levels. Collect power-up carefully in order to get what you need! 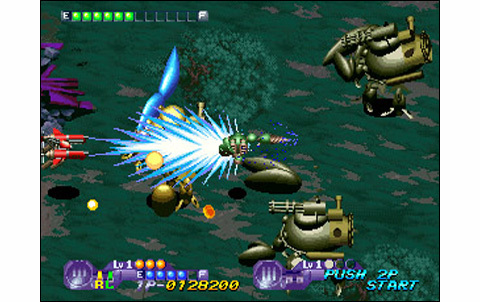 The module weapon, the R-Arm, has three variations: a drill, a slicing-saw, and a devastating piked bowl... 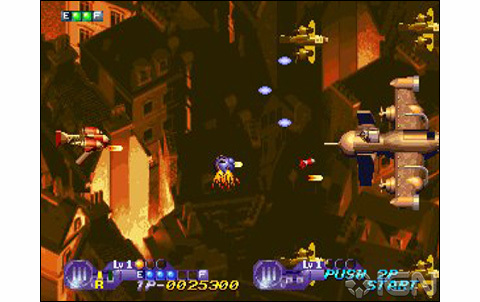 In addition you can use the smart bomb with C. Learning to efficiently use all these possibilities takes some time, but it really enhances the gameplay and finally, the depth of the game. 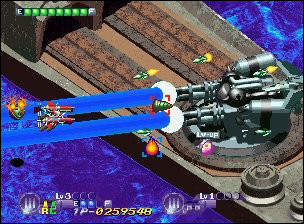 Graphics are mixing computer graphics and pixel art, and it's colorful, varied and detailed. The 3/4 view from higher than usual requires a little apprentice, as it's a bit annoying at first. 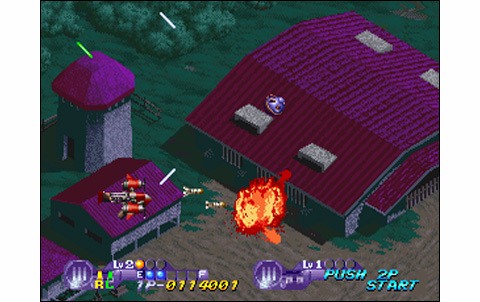 It's a good job anyway, but still far from the visual prowess of a Blazing Star or a Last Resort, to name a few. 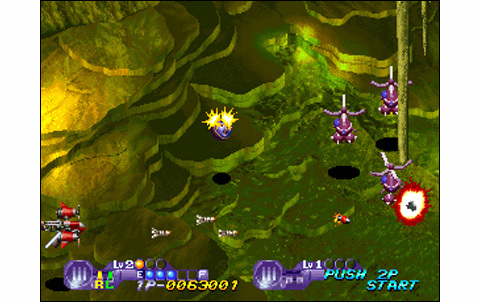 The Bosses are sometimes impressive and sometimes deceiving: reach some later stages, you'll understand what I mean. 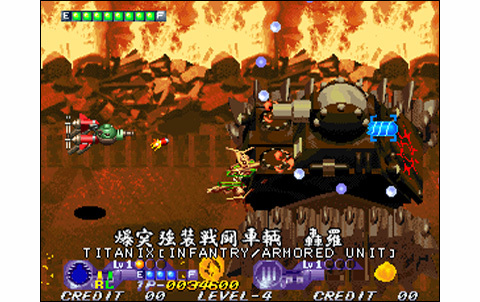 Otherwise, enemies are averagely varied although well designed. On the other hand, musics are catchy at will and stand as a highlight of the game, mixed with original and great quality sound effects. Animation is fluid and quite fast, with vessels and Bosses showing a well-decomposed animation. There's many slowdowns to report, not so disappointing in a single-player game, but it's a total mess when it comes to cooperative play, and the gameplay suffers from these numerous lags. 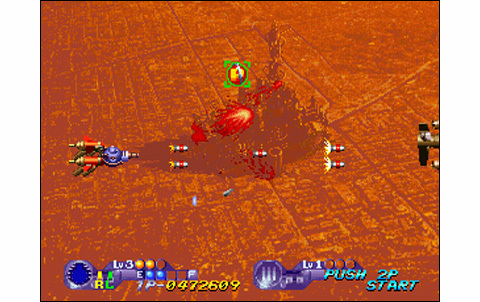 It reminds us that the game was programmed on the slightly weaker CD system. 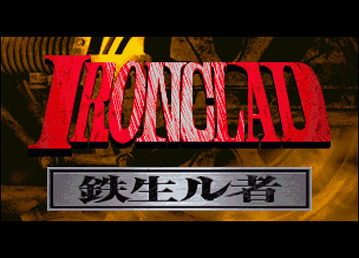 Anyway, we still enjoy playing that Ironclad which had us so much waiting for it on cartridge support, and not to spoil anything, the life is very good. It won't be easy to come through with the four basic credits... So get ready for action! 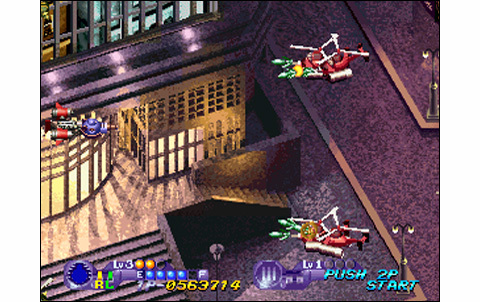 Photo-realistic style stages are looking good, colorful and pretty varied. The overall presentation is clean and ships are nicely drawn. Fluid, fast, decomposed... The main flaw still being the numerous slowdowns, especially when playing two. Very good for this kind of game, with numerous stages, many different routes and a balanced difficulty, which allow hours and hours of single or two players games! Original and rich, flying with the three combat vessels is a great and interesting learning. Controls respond perfectly, except in two players mode due to the slowdowns. 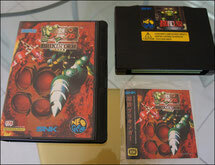 A game you can't miss on the Neo Geo! Gameplay with great new ideas, original style, great challenge... Hold your sticks! An Ironclad conversion cost 250 euros on average, which is still an investment. Last Resort, ASO II, Ghost Pilots and Andro Dunos offer a best rate, just to name a few. 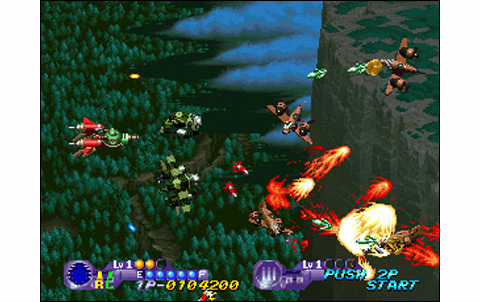 But if you're looking for the biggest shooters on the sytem, our Choutetsu Bri'kinger looks reasonable.